Commodity Channel Index (CCI) is oscillator created for identifying cyclical trends for commodities. Since it was created, popularity of this indicator has grown, so now it is used not only for commodities. TYP indicator and SMA indicator are included in calculation of CCI. For parameter n is usually used value of 20 or 14. 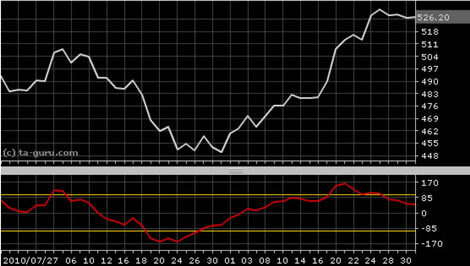 CCI is oscillator so one interpretation is identifying overbought and oversold levels. If value of CCI is above +100, financial instrument is considered oversold. If value of CCI is below -100, financial instrument is considered overbought. Another interpretation is divergence: if price of security is falling, but value of CCI is rising (positive divergence below -100) we could expect that soon prices will start to grow. Similar applies to up trend (when price is rising and CCI is falling (towards +100), soon trend will change). Open chart for google with CCI indicator.